I like the coke (soda) theme real well. Maybe a pepsi theme color. I have a coke machine that I had restored. It looks really nice. I also just bought a pepsi machine. It runs and works but won't cool. Needs freon. The barrels as I said are, one is root beer, one is orange crush and one is mountain dew. The last one will probably be a caboose type. I would like for the wheels to be maybe white or polished and plenty of chrome on the tractor. You're gettin' me worked up again. Tractor312, I liked that comment about your nice tractors. Funny. you think that would do it??? lol Bolens are great tractors that would be perfect!! I like it KW. Are you sure it would do the job. My e-mail is guerrae9@yahoo.com. Write me and let's see what we can come up with. Have a great one. I probably won't be back on here til after church tonite. The Bolens looks to be in great shape is it as good as it looks in the picture?? that tractor will have plenty of pull for what you need I would think. 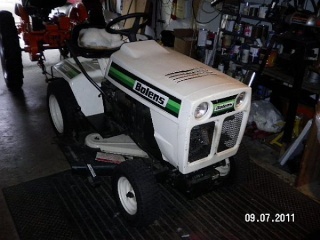 I had a few bolens over the years and they are tough Garden Tractors. 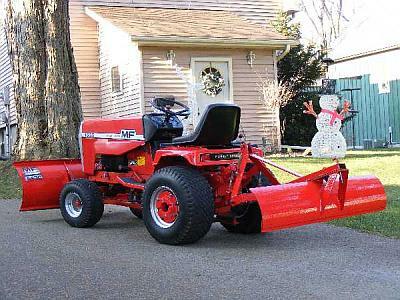 I like it, but I still like the "tractor" style. I'm not sure what they're called tho. I got a feelin' me and KW will end up workin' something out this winter. KW...wonder if Zach would be interested in selling the coke machine? This is just a thought. He could keep it a couple months then decide lol. See ya. it's really nice larry,it runs perfect,transmission is perfect,I don't think it was used much if it was it was definitly kept inside and probably a small yard,it's never had a repaint and the deck is not scuffed up much at all.It's only problem is it has a deck bearing out of course if papaw ends up with it you would want the deck off anyways or i would.If no one wanted it i was going to put a deck bearing in it and turn it loose in the spring,it looks really clean i wasn't going to paint it just clean it up. well it is probably just the older body style you like papaw.The bolens is the same type as the old ones 5 lug heavy frame etc. it's just not real old. he told me he was going to surprise his grandfather with it,I said thats nice your gonna give it to him and he said well for a little while lol.Really don't know if he'd sell it or not he seemed to really like it...I really think it would have a hard time with your train papaw,it had a heavy enough frame and a cast rearend but only a 6hp engine i would bet it would pull it but all day long in a parade would be pushing it in my opinion.No problem at all if you didn't want the bolens but thinking on what your pulling i think you should go at least a 10hp and up.I just keep thinking of the amount of train cars and full of kids in a parade throw in a few hills and you need a good strong tractor.Larry probably brought this up when you first started talking about it,he has more common sense than me lol. the tractor in my avatar would work !! keep your eye out for a diesel the ford will pull a house and its liquid cooled so it can go all day! yea it's definitly not a big deal to me,if you don't like the looks of the bolens we can just find something else older and cool looking for ya papaw.It's nice but not really a cool tractor look for me,it's definitly clean enough to just put a bearing in and sell but for myself I never intended on painting it.You can tell it would pull like a brute it's just got a common tractor look..
Thanx KW. I'm really more interested in something like the "Great Pumpkin" style. I'm not in a hurry and never really get in one. I'm pretty laid back. So I'll wait 'til you come up with something in that style. Keep in touch with me and I'll check in every now and then.